Pankaj Kumar, a 22-year-old visually impaired resident of Motihari, Bihar had contacted the Eyeway Helpdesk in order to seek information on living life with blindness. He comes from an economically poor background. His father works as a farmer and his mother is a home maker. Pankaj isn’t blind by birth, his eyesight started to deteriorate when he was in Class 8 due to glaucoma. He managed to complete that year with deteriorating eyesight but could not pursue his education further. When the doctor declared that his eyesight could not be restored, Pankaj and his parents were very upset and lost hope for his future. Although his parents were illiterate and had little money, they wanted to look after him, but they had no idea as to how. For the next two years, he spent his time sitting idle at home not knowing what else to do. During this time, Pankaj heard about Eyeway on the radio and called the toll-free helpline to seek guidance. On hearing his story, the Eyeway counselor advised Pankaj to join a rehabilitation centre and continue his education. However, Pankaj could not pursue this due to his family’s insecurity to let him out of the house. He lost four years in the process and became extremely depressed for this reason. But Pankaj was desperate and so he once again contacted the Eyeway Helpdesk looking for a way to make some change in his life. 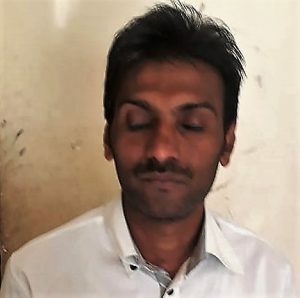 On speaking to the counselor, he decided to come to Delhi to join a vocational and rehabilitation course at the Blind Relief Association (BRA) where he would be given proper training and could simultaneously pursue 10th standard through open schooling. Now, Pankaj has finished his 10th standard and a one-year stenography course along with 3 months of computer training from the National Association for the Blind, Faridabad. He will be appearing for his 12th CBSE board exams in March 2019. Pankaj expresses his utmost gratitude towards Eyeway for constantly helping him and guiding him through the years from a state of despondence to that of independence. He now uses a computer, an android phone and other assistive technology for his education. After 12th, he plans to complete a Bachelor’s degree so as to broaden his range of employability options.